It's been over twenty years since the Wesley Snipes fronted Black Panther movie was shelved by Columbia Pictures, but now, Marvel Studios have finally saw fit to give the King of Wakanda his cinematic due in the 18th addition to the ever expanding Marvel Cinematic Universe (MCU), under the capable direction of Creed’s Ryan Coogler. After his incredible debut in Captain America: Civil War, T’Challa aka the Black Panther is the sovereign-in-waiting of the reclusive, but highly advanced, African nation of Wakanda, after his father, T’Chaka, perished in a bombing. However, it’s no small feat, with challenges for the throne from fractions within his own country, as well as two foes who conspire to drag Wakanda into a new world war. Over the past few years, Marvel has hit a winning streak, with nearly all of their films being good or great. Black Panther is no exception and continues that streak in style, with a hybrid of Blade Runner and James Bond, sprinkled with African culture. Chadwick Boseman returns as the newly appointed king, proving he truly was the right choice for the role. He gives a great performance as a king trying to continue his father’s legacy, while also being physically able to handle several demanding action scenes. Ryan Coogler favourite Michael B. Jordan makes his return to the superhero world as the movies antagonist Erik Killmonger, a violent force with a mysterious past. This is a significant step up from Jordan’s last comic book appearance as Johnny Storm in Josh Trank’s ill-fated Fantastic 4 (2015). Killmonger is arguably one of the best villains Marvel has adapted to the big screen. He’s brilliantly fleshed out and relatable. His motivations are completely justified and you really feel for him, until it becomes apparent how ruthless he can be. Letitia Wright plays Shuri, a funny and entertaining scientist, and T’Challa’s little sister. The chemistry between them is fantastic and their relationship is brilliantly realised, with a small sequence early on and some quick humorous remarks dotted throughout the film. She also acts as the Q to T’Challa’s 007, providing him with multiple gadgets, including a snazzy new kinetic suit. Like the rest of the MCU, this features plenty of prominent strong female characters, including Lupita Nyong’o as spy Nakia and Danai Gurira as Okoye, the head of T’Challa’s all-female bodyguard team, Dora Milaje. They all get their own moments to shine and have some fantastic action scenes between them. There are a number of other returning characters from Marvel’s previous instalments, such as Martin Freeman as Everett K. Ross, who appeared in Captain America: Civil War (2016), and Andy Serkis as Ulysses Klaue, who last featured in Avengers: Age of Ultron (2015). Both of them have some great moments and really add extra layers to flesh out the rest of the film’s story. In terms of story, the film twists and turns through a number of ideas that blend together seamlessly and form a complex but easy to follow plot, structured in a great three part act. 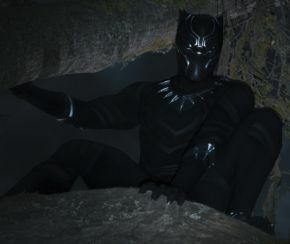 Part of the story involves T’Challa hunting down Ulysses Klaue, who is attempting to sell off the hardest metal on Earth,Vibranium, while the rest of the film is a tense struggle for power over the Wakandan throne. The score was composed by Ludwig Goransson, who gives a unique African, orchestral and electronic soundtrack that sounds incredible in surround sound. He even travelled to Senegal and South Africa to record local musicians to form the base of the score. Kendrick Lamar got involved too by producing the film’s curated soundtrack and developing three original songs that appear throughout the movie. Cooglar chose him because Lamar’s artistic themes align with the ones explored in the film. Like the rest of the MCU, Black Panther utilises the skills of Industrial Lights & Magic, who provide the visual effects. For the most part, they look amazing, with the stunning Ancestral Plane being a highlight, where a character can communicate to deceased relatives for a short time. There are a couple of moments where the effects become a little overpowering and starts to look like computer graphics that needed some extra polishing, however, the investment in the characters and the attention to detail makes you forget about that and enjoy the spectacle. And a spectacle it truly is. Nearly all of the film takes place in Africa with a near all-black cast. It embraces the culture, from the costumes to the music, creating one of the most immersive ventures into the country ever put to the big screen. It’s bright and colourful and marks a significant step for diversity in Hollywood. Overall, Black Panther is one of the best instalments so far from Marvel Studios, with a great cast and brilliant story telling. Ryan Coogler has created an ambitious and well-made movie that will appeal to most audiences and get fans excited for Black Panther’s return in Avengers: Infinity War. Purple Revolver rating: 4.5/5 – Legacy and honour fulfilled.